This collection of essays by leading American film scholars charts a whole new territory in genre film criticism. Rather than assuming that genres are self-evident categories, the contributors offer innovative ways to think about types of films, and patterns within films, in a historical context. Challenging familiar attitudes, the essays offer new conceptual frameworks and a fresh look at how popular culture functions in American society. The range of essays is exceptional, from David J. Russell's insights into the horror genre to Carol J. Clover's provocative take on "trial films" to Leo Braudy's argument for the subject of nature as a genre. 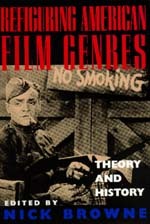 Also included are essays on melodrama, race, film noir, and the industrial context of genre production. The contributors confront the poststructuralist critique of genre head-on; together they are certain to shape future debates concerning the viability and vitality of genre in studying American cinema. Nick Browne is Professor of Film at the University of California, Los Angeles, and coeditor of New Chinese Cinemas: Forms, Identities, Politics (1994).